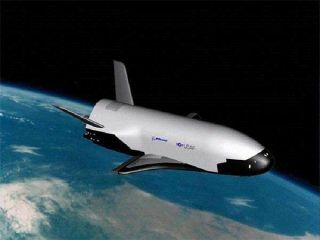 The U.S. Air Force's X-37B (shown here in an illustration) is an unpiloted military space plane capable of long-duration flights in Earth orbit. The robotic spacecraft has a solar array for power and a payload bay the size of a pickup truck bed. It has been a long haul to the launch pad, but the U.S. Air Force and Boeing are gearing up to loft the X-37B – an unpiloted military space plane, SPACE.com has learned. Tucked inside the shroud of an Atlas V Evolved Expendable Launch Vehicle (EELV), the winged craft will be boosted out of Cape Canaveral, Florida, orbit the Earth and then make an auto-pilot landing in California. The X-37B OTV-1 (Orbital Test Vehicle 1) is currently on the launch manifest for January 2010, explained U.S. Air Force Captain Elizabeth Aptekar, who works in media operations for the Secretary of the Air Force Office of Public Affairs in Washington, D.C.
"The vehicle is ready for the shipping process, which includes minor close-out activities," Aptekar told SPACE.com. "The vehicle will ship at the conclusion of the pre-ship activities ... which should be approximately 60 days before its launch date." Years ago, the X-37B was originally slated to be deployed from the payload bay of a space shuttle. But following the tragic Columbia accident, the craft was transferred to a Delta rocket, and then later geared to be sent aloft via the Atlas V EELV. In July 1999, Boeing Phantom Works began work to develop the X-37 via a four-year cooperative agreement with NASA. In November 2002, Boeing was awarded a $301 million contract to continue the development of the X-37 flight demonstrator. That contract included the development of an X-37 Approach and Landing Test Vehicle to carry out a progressive series of approach and landing tests, followed by the development of an X-37 vehicle designed as an orbital flight test craft. The vehicle's long and winding history includes an X-37 government team that was once led by NASA's Marshall Space Flight Center in Huntsville, Alabama. Also at one point, the project fell under the Defense Advanced Research Projects Agency (DARPA). While next year's flight profile remains a bit hazy, reports have the X-37B under auto-pilot control zooming into Vandenberg Air Force Base for a landing, or perhaps at Edwards Air Force Base, California. As a reusable space plane, the intent of the craft is to serve as a testbed for dozens of technologies in airframe, propulsion and operation, and other items in the hopes of making space transportation and operations significantly more affordable. According to earlier press releases issued by Boeing, the X-37 orbital craft is capable of circling Earth for up to three weeks. "Potential new commercial and military reusable space vehicle market applications for these technologies range from on-orbit satellite repair to the next-generation of totally reusable launch vehicles," explained past Boeing-issued material. The intent of the X-37B mission is to try out a wide variety of experiments and technologies, including a highly durable, high-temperature thermal protection system; storable, non-toxic liquid propellants; and important new aerodynamic features - all of which are applicable to future reusable space vehicles. The vehicle is about 27.5 feet long with a roughly 15-foot wingspan and tips the scales at about 5 tons at liftoff.